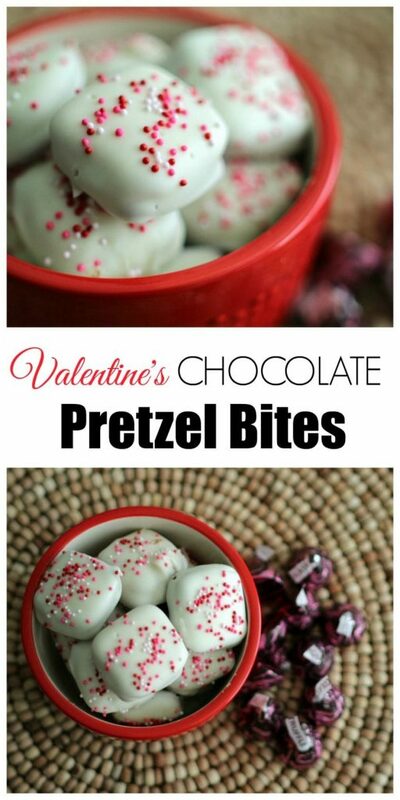 If you’re looking for a Valentine’s snack idea that’s perfect for bringing to the office, your child’s party or to give your special someone, these Valentine’s Chocolate Pretzel Bites are a big hit. Do these look a little bit familiar? 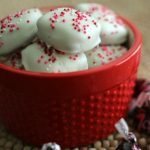 If so, that’s probably because you saw or made these Peppermint Pretzel Bites I teamed up with Hershey’s on for the holidays. I heard from so many of you that you made these and couldn’t get over how easy and yummy they were. They only require four ingredients: Square Waffle Pretzels, Hershey’s kisses, White Chocolate and Sprinkles. 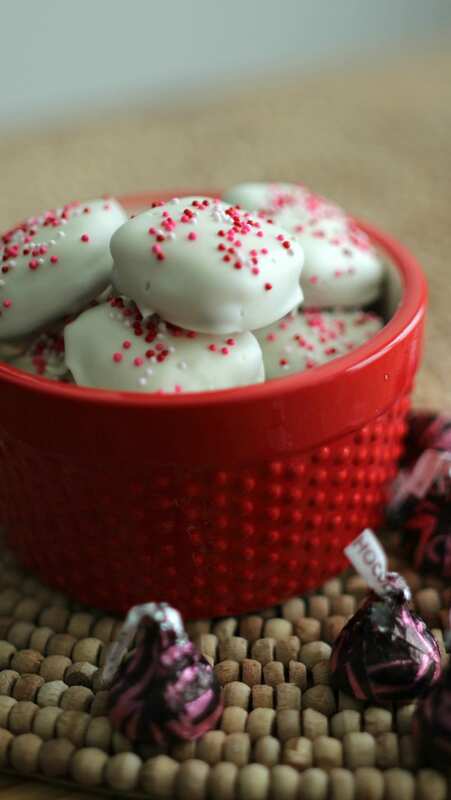 Instead of peppermint kisses which are so popular during Christmas time, I used Hershey’s chocolate truffle kisses which are dark chocolate with rich truffle centers. In other words….AMAZING. 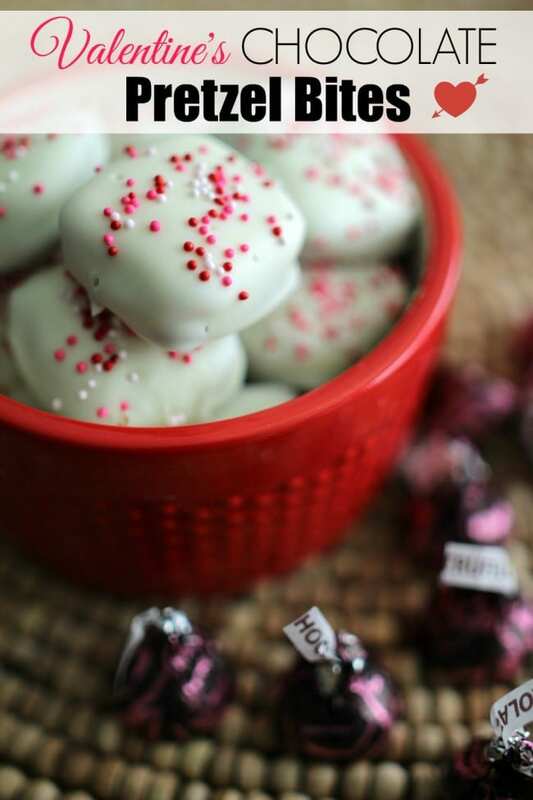 But you could use any Hershey’s kisses you want for this recipe. Would you like to see how easy they are to make? Watch this video we shot of making this yummy Valentine’s snack. Step one: Place waffle pretzels on a baking sheet lined with parchment paper. Step two: Place one unwrapped Hershey’s kiss on each pretzel. Step three: Bake at 350 degrees F for 2 minutes, or until you notice they are getting glossy and losing their shape. Step four: Take them out of the oven and place another waffle pretzel on top, squishing the chocolate a little. Step five: Chill in the freezer for about 10 to 15 minutes, or until the chocolate has hardened. Step six: Melt the white chocolate in a bowl and then cover each pretzel bite with chocolate completely. Step seven: Place on a wire rack with parchment paper underneath to catch the chocolate drips. Step eight: Before the chocolate hardens, sprinkle with festive Valentine’s sprinkles. Step nine: Let harden and either package up to bring to your get together or eat them instantly. The choice is yours. You could either package these up in cute Valentine containers or put them in Valentine snack baggies, making it easy for party goers to grab and enjoy. They would also be really cute displayed in these striped & chevron popcorn boxes. 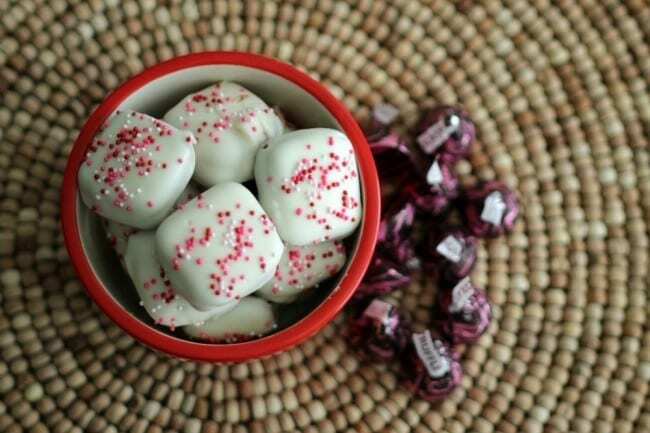 These Valentine’s Chocolate Pretzel Bites are the perfect combination of salty and sweet. Here’s the printable recipe and instructions. A salty and sweet combination for Valentine's Day. Step two: Place one unwrapped Hershey's kiss on each pretzel. Step eight: Before the chocolate hardens, sprinkle with festive Valentine's sprinkles.